One Wall Street analyst thinks the number of retail store closures is just getting started. The numbers could be shocking. Put those retailers on life support. And you thought the death of the beloved Toys 'R' Us at the hands of online shopping would mark the last headline-grabbing retail chain to go bust. New research out of UBS estimates that for each 100 basis point increase in eCommerce penetration as a percentage of total U.S. retail sales (currently 16%), an additional 9,000 stores would have to close to maintain existing levels of sales per square foot. At least maintaining current levels of sales per square foot is critical in retailers achieving their profit goals, and staying afloat. 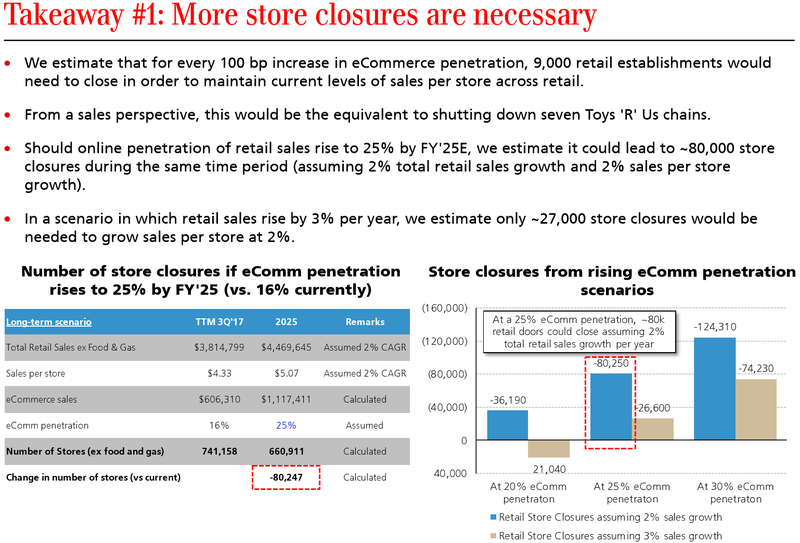 To put that number of possible store closures in perspective, that's equivalent to seven Toys 'R' Us chains. But it may get far worse, UBS estimates, in part as the likes of Amazon (AMZN and others expand aggressively online. Should eCommerce penetration reach 25% by fiscal year 2025, about 30,000 to 80,000 retail doors would have to close to maintain low-single digit growth in sales per square foot. Fortunately, some sectors in retail have been disciplined in their store opening plans in recent years. That has left them store bases that actually aid their online business. For instance, Home (HD and rival Lowe's (LOW locations offer ship from store options to customers. Home Depot has found success delivering products straight to contractor job sites. With the stores being used as service centers, that has helped boost the productivity of the locations for the big home improvement retailers. "As we see it, the supply/demand conditions are another reason to be bullish on Home Depot and Lowe's," UBS writers. In the most recent reading, the home improvement sector actually saw a 1.1% year over year decline in total stores -- if the sector is losing stores now, that should accelerate as the cycle matures." Data like this should make anyone think twice before investing in the retail space -- the need to close more stores will likely pressure profit margins in the sector. That's reminder is especially so seeing as the sector has enjoyed a decent rally during the last 12 months on prospects for solid consumer spending. The Consumer Discret Sel Sect SPDR ETF (XLY has gained 17% in the past year, out-performing the S&P 500's 14% gain.